Posted on Tue, Mar 20, 2012 : 9:21 a.m. The Dexter tornado was on many readers' minds this week. 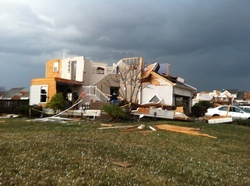 United Way of Washtenaw County established the Dexter Area Torando Relief Fund to assist those affected by Thursday's tornado. 100% of the funds collected will go directly to help with the long term recovery efforts. By: julieswhimsies: Tornado near miss. Approximately 50 employers and 20 non-profit representatives will participate WCC’s 15th Annual Spring Job Fair and Nonprofit Showcase on Tuesday, March 20. By: Dawn Farm Education Series: Health care for people with alcohol/other drug addiction - can health providers and people in recovery be allies? By: Kelly Trosin: Dog Food Fundraiser to Benefit Pack of Rescued Dogs! Tue, Mar 20, 2012 : 1:59 p.m.
A2.com please stop asking people to donate items. The schools have more stuff then what people need. They don't need items they will be needing money, gas cards, food cards, ect... If you want the people from Dexter to get the money please donate to an account set up by school and faith in action. The red cross will not give money directly to the victims. Thank you Red Cross for everything you did.